Apart from storing the file system metadata in the RAM, the Namenode also stores this information on a set of files. The two important files among them are the fsImage file and the Edit Log file. 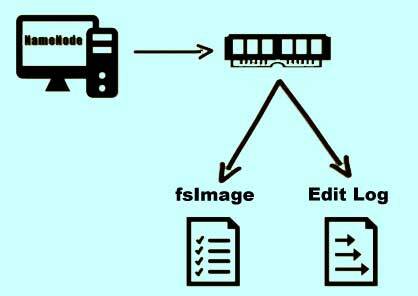 The fsImage stores the complete snapshot of the file system metadata whereas the Edit Log file contains all the incremental modifications done to the metadata. The fsImage file stores information about all the blocks that belong to a file and the file system properties. The Edit Log, on the other hand, keeps track of all the transactions that take place on the file system. For example when a new file is created and an entry is made into the Edit Log file. Another example - if the replication factor is changed then an entry is made in the Edit Log file. How to manage File System Metadata in detail? When the Namenode starts it reads their fsImage and Edit Log file from the disk and applies all the transactions to the metadata from the Edit Log file that has been copied to the RAM. A new version of their fsImage is written on to the disk from the memory. In this new Edit Log file all the old entries are truncated. This process is known as a checkpoint and occurs every hour or whenever the Edit Log file reaches to 64 MB in size, whichever occurs first.